Even though Valero Energy continued to post solid earnings results, Wall Street has soured on the company's outlook. After posting several quarters of fantastic growth, the market has turned against Valero Energy's (NYSE:VLO) stock in a hurry. Shares of Valero are more than 30% down from their high less than six months ago. The strange part about this decline is that the company continues to post great results. So why has Wall Street made such an abrupt pivot with Valero? Let's look at the company's most recent results, why Wall Street is so bearish, and whether that matters much for long-term investors in this stock. Data source: Valero Energy earnings release. EPS = earnings per share. Valero's results show that the company is still reaping huge rewards from transportation and logistics constraints for crude oil across North America. In the third quarter, Valero's refining margin was $10 per barrel, down slightly from this time last year but still a healthy margin in general. These results eclipsed anything that happened in its ethanol or its Valero Energy Partners (NYSE:VLP) segment. Data source: Valero Energy Corporation. Chart by author. Even though it's abundantly clear that refining is the driving force for Valero's business, the company made a couple of moves this past quarter in its other business segments. For one, it acquired three ethanol production facilities totaling 280 million gallons per year of production from Green Plains for $328 million, including working capital. The deal will boost Valero's current corn ethanol production capacity by 19%. This ethanol acquisition is in addition to the recent expansion project at its Diamond Green Diesel facility that can now process 16,500 barrels per day, or 250 million gallons per year. Management intends to keep growing production at this facility with another expansion and a second parallel facility that will boost its production to 44,000 barrels per day. In its recent investor presentations, Valero intends to also boost its ethanol export capacity, which is one of the more profitable routes for ethanol these days. The other deal management announced recently was that it's re-integrating Valero Energy Partners by acquiring all outstanding shares in a deal worth about $950 million. Instead of using shares, Valero is electing instead to pay cash for the partnership's units. Valero Energy Partners went public back in 2013, and management has consistently raised its payout to entice investors, but the stock has habitually traded at a discount to its peers, which makes it less lucrative to sell assets from the parent company to the subsidiary in exchange for more units. Also, the changes in corporate tax rates mean master limited partnerships no longer have the same types of tax advantages they once did. 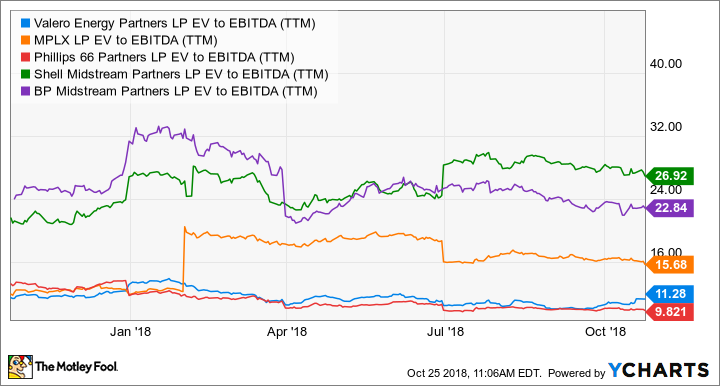 So instead of continuing with this particular corporate structure, Valero is electing to roll Valero Energy Partners back into the business at a time when shares are only at a modest premium to their IPO price less than five years ago. As we look forward to the fourth quarter and into 2019, we remain optimistic. Global economic activity continues to grow at a reasonable pace. In the U.S., unemployment rates are at record lows. Domestic and international product demand is strong. Gasoline export volumes are expected to increase seasonally while distillate exports should moderate as winter demand picks up in the Northern Hemisphere. Despite margins incentivizing maximum distillate production at relatively high industry utilization, days in supply for distillate remain new five-year lows. You can read a full transcript of Valero Energy's conference call. On paper, Valero's results look good and don't give investors too much reason to be worried about their results. The thing that probably has Wall Street running scared lately is that some of these beneficial trends for the refining industry -- pipeline and transportation bottlenecks for crude oil, record low unemployment -- may not last much longer. For example, there are millions of barrels of new pipelines under construction that should help to erase some of those wide regional price discrepancies for crude. Also, additional capacity to export crude to the global market will probably bring domestic crude prices more in line with international prices. These two things are likely to lower refining margin in the next couple of years. That said, Valero has done a commendable job of extracting value from its refineries and supply chain. It intends to increase its production capacity for both refined petroleum products and ethanol as well as increase its own export capacity to serve fast-growing economies globally where product demand is rising with the emerging middle class. The company is by no means immune to the cyclical factors that influence this industry, but it has some longer-term catalysts in place to increase shareholder value over time. 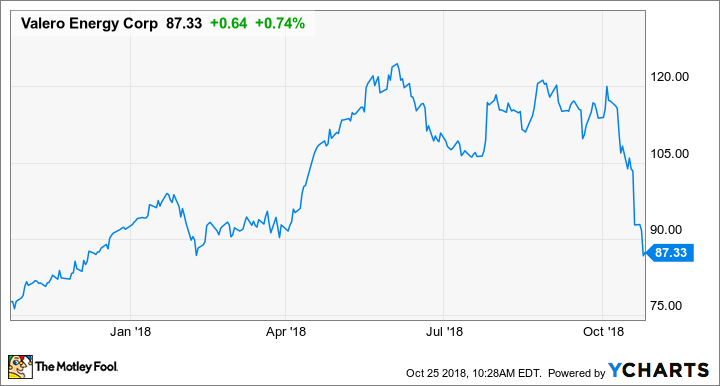 I can't say with certainty that Valero's stock will stop dropping, but its current stock price does make it worth considering as a potential investment.